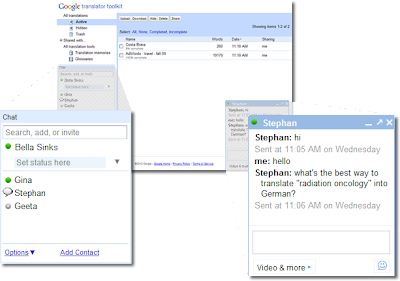 Just like chat in Gmail, you can send instant messages to colleagues, friends, family and groups directly from within Translator Toolkit. All the features and settings of chat are the same as what you're used to, including going on the record to save your translation chats in Gmail. If you don’t want to be interrupted as you work on a translation, you can simply go invisible or turn off chat through the Translator Toolkit settings. Collaboration is an important part of translation. Whether you work with editors to translate documents, customers to clarify terms or project managers to meet deadlines, working with other translators is key to making high-quality translations. Today, we’re making it easier to collaborate on translations with the release of chat in Translator Toolkit.